The processed meats are classified in the first category of carcinogenic compounds due to its numerous health issues. For this reason, there is a growing interest to utilize healthy ingredients for formulation of meat-based products. The objective of this study was to replace completely and partially meat by plant proteins in sausage formulation and compare the characteristics of these novel formulae with full meat sample. The results showed that the plant proteins minimized the cooking loss and shrinkage and improved emulsion stability by creating a strong structural network in cooked emulsion. In contrast, the full meat samples had better strength/elasticity in terms of folding score (4.67 out of 5) and gel strength (2553.68 g mm) when compared to meat-reduced and meat-free samples. 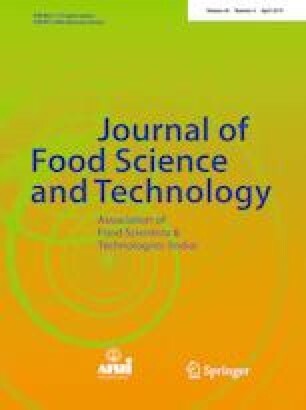 The sensory assessment showed that replacement of chicken meat by plant proteins was highly acceptable in terms of texture, odor, color and overall acceptance. Overall, it is concluded that plant proteins can be regarded as promising ingredients to replace 80–100% meat in sausage. The authors are grateful to the Director CSIR-CFTRI, Mysore for providing necessary facilities. The first author also wishes to thank the Council of Scientific and Industrial Research (CSIR), India and The Third World Academy of Sciences (TWAS), Italy for the award of research fellowship (FR No. 3240280457).